Above: external view of the Dwelling located in Colchester, Essex. The installation of cavity wall insulation by the injection of either foam or fibrous insulants is a design approach fraught with risk. There is little statistical research available upon the consequences of post-construction filling of cavities with insulation, other than a single Building Research Establishment document. That suggests there is a demonstrable risk of increasing moisture penetration to the interior by the use of such post-facto methods of upgrading thermal insulation values. There is also the risk the fibres will not fill the cavity, leaving cold spots in the external fabric. These can lead not only to internal discomfort for the occupants, but to localised condensation and surface mould growth, as was the case in this matter. 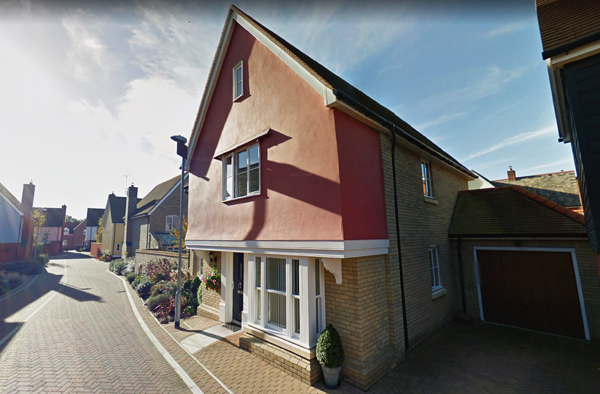 In this instance we were instructed as a Single Joint Expert acting for both parties: a specialist Supplier responsible for the installation of thermal insulation to cavity walls as part of the project (the Claimant), and the Main Contractor who had constructed the dwelling (the Defendant). The Contract Conditions placed upon the Supplier by the Main Contractor required the former to comply with the requirements of, inter-alia, the current Building Regulations (the relevant Parts being Part C & Part L), NHBC requirements (the relevant requirement being Standard 6.1/S), Local Authority requirements and the requirements of (undefined) British Standards. The Supplier sub-contracted the Works to a specialist installer. The dispute arose from the refusal of the Main Contractor to pay Invoices for alleged defective works. Our role was not to investigate the cause of the problems being experienced, but to express an Opinion upon which of the parties were responsible for the failure. The Contractor who had undertaken the development of the group of properties, or the Supplier responsible for the installation of the thermal insulation. The product to be used was insufficiently described upon the Drawings provided by the Main Contractor to the Installer, simply being described as "..blown fibre..". At the time of installation that description could be applied to either mineral, cellulose or glass fibre. The consensus between the Parties was that a glass fibre had been installed. At that time there was no applicable British Standard for the use of blown glass fibre as a cavity insulant and, at the time of writing, there remains no relevant Standard. In the absence of a relevant British Standard for the installation the default standards are those contained within the applicable Agrement Certificate, as compliance with the conditions of such a Certificate are deemed to demonstrate the resultant works comply with the relevant requirements of the Building Regulations. However, it should be noted that to demonstrate compliance with an Agrement Certificate the requirements of the Certificate must be followed in every single particular. Unfortunately, the Supplier's work and processes failed to adhere to the requirements of the Certificate. In particular the they failed to: undertake and document Site Survey and Preparation; failed to ensure the product was installed under a Third Party Certification Scheme, or that the Works were undertaken by suitably trained and approved employees; installed the insulation in a brickwork wall featuring recessed joints, contrary to the requirements of the Agrement Certificate; failed to record supervision of the installation work; and, failed to provide Tender and Invoicing documents bearing the information required by the holder of the Agrement Certificate. In consequence the installation failed to meet the requirements of the Agrement Certificate and thus the Main Contractor was unable to demonstrate compliance of the newly constructed dwelling with the requirements of the Building Regulations. Remedial actions were necessary to remedy the defects caused by the defective work. That remedial work was undertaken by the Main Contractor at its own expense. The morale of the story? For architects: avoid blown-fibre cavity insulation in all circumstances, and most particularly in any new-build work. For Contractors: if blown-fibre cavity insulation is to be used ensure compliance in every single detail with the requirements of the applicable Agrement Certificate. Better still, use an alternative approach. The primary purpose of the cavity in a masonry wall is to provide a secondary line of defence against moisture penetration from the exterior. And, to provide a route for the removal of any moisture which does penetrate the external leaf. Studies have suggested that in some instances 80% of rainfall incident upon the external face of a masonry wall will penetrate to the inner face of that leaf and descend within the cavity. Therefore, and for obvious reasons, it is prudent to avoid filling the cavity with fibrous thermal insulation. In this instance the Parties reached a settlement following our Report.